I use an approach called “Lectio Divina” when I have my Scripture time in Personal Worship. 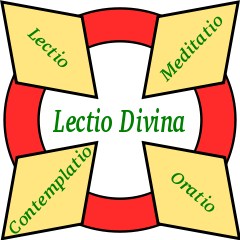 Lectio Divina (which means “Divine Reading”) was a spiritual discipline developed by St. Benedict in the 5th Century. Its application is varied, depending on the tradition, and I view it a principle than an exact methodology. The main thrust behind Lectio Divina is to allow God to speak and guide us during the reading. That is why I use it: it is very much aligned to the concept of Whole Life Worship, especially to how I view Personal Worship time. Lectio Divina keeps the discipline of Scripture reading focused on the relational aspect of Personal Worship. It helps me to anticipate God speaking to me through His written Word. In Lectio Divina (LD) there are four readings of a short Scripture passage (6-8 verses or a paragraph or short section) that lead into four reflections. Narrative passages (like Gospels, Acts, or OT stories) work best with LD. This is because the narratives are stories that allow for different angles and perspectives that the Holy Spirit uses to speak to our hearts. However, I’ve used LD for non-narrative passages of Scripture (like Pauline epistles and Psalms) and, though it requires a little more care, it has been helpful. 1. The first reading is called the “Lectio.” The purpose of this reading is just to expose ourselves to the Word. I find it helpful to read this reading aloud. In the first 15 centuries of the church, most Christians only “heard” the Word of God. Reading aloud and hearing Scripture is a totally different dynamic than visually reading it; especially when it is read with intention and with the emotion associated with the text. After reading it aloud, I just let it sit in my soul for a few moments of silence. Certain words or phrases stick out and I make note of that. 2. The second reading is called the “Meditatio.” As you could guess, this reading is about meditating on certain thoughts; ruminating them in my soul. As I read the passage again (either aloud or visually), I ask the Holy Spirit to move in my soul at the places where I need to focus my attention. Often it is the phrase or word that stood out to me during the Lectio reading. The reflection time after this is longer as I ponder the meaning of the text and what the Spirit is leading me to focus on. 3. The third reading is called the “Oratio.” This is the Latin word for “prayer.” In this reading, I ask the Holy Spirit to give me a holy “desire” from this passage. I notice what might be lacking in my life (love, wisdom, courage, faith, hunger for righteousness, etc.) as I read the passage again. My reflection time becomes a prayer, an intercession, a petition – most of the time for my own transformation, but sometimes He will lead me to pray for another person. This is usually a very powerful time as I sense my will is converging with the Father’s will. 4. The fourth reading is called the “Contemplatio.” You can guess that this is where the word, “contemplation” comes from. But most of us might not know that contemplation, in the Christian sense, means “union.” After the fourth reading, the focus of reflection is simply being present to the Lord. Being somewhat new to the process of LD, I find that this is mostly a time of waiting for me. Every once in a while there will be a sense of union with Christ (something that is incredibly wonderful!) but more often than not, I will not experience this. I believe I am learning to condition my soul to not look for the “experience” but to get to the place where I simply “belong” to the Lover of my Soul. Lectio Divina is not for everyone. It is just one way to approach Scripture in Personal Worship. But at this stage of my journey, I find it powerful and transformative. Most of all, it puts the focus on Him as my teacher and instiller of the Word of God in my life.